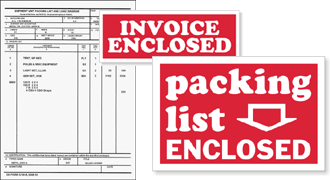 Manufacturers, suppliers and retailers enclose commercial invoices, packing lists, or bills with their packages, so always label the package with Packing List Inside or Invoice Inside stickers so everyone knows to review the list and their shipment to make sure everything was received. • Flexographically printed with color-fast inks for durability, with a striking glossy surface. • Pressure-sensitive, self-adhesive paper on rolls of 500. • And, order a label dispenser to efficiently manage your roll of packing list labels. • Fluorescent labels offer great visibility and grab attention instantly. Create professional quality personalized mailing labels at no extra cost. Choose pre-designed templates to get started.